The best way to keep houseplants healthy and attractive is to choose healthy, thriving plants to bring home. Inspect each plant for discolored or withered foliage, broken leaves or limbs, or signs of bugs, mold or other infestations. Avoid plants that show stress, as they may not survive moving to a new area and the rigors of transplanting or repotting. Choose plants that can thrive in your home, considering temperature range, available sunlight and ambient humidity to be sure you can give them a good environment. Position plants in rooms with the proper light. South and west-facing windows provide the best light, but some plants can thrive in lower light conditions. Avoid placing plants near excessive drafts, such as vents, fans or leaky windows. Use high quality potting soil blended for specific plants' needs – succulents and cacti require different drainage and soil conditions than tropical plants or flowers. Add peat moss, sand or gravel to the soil to increase drainage if necessary. Water plants regularly, paying attention to their individual watering requirements. Do not allow roots to rest in water (they can develop rot), and use room temperature distilled water or tap water that has sat in an open container for at least 24 hours to remove chemicals. Adjust humidity to help plants thrive. In dry climates or in winter, add a pebble tray filled with water near plants to increase humidity, or group plants together so their transpiration will increase the humidity to neighboring plants. Misting can also increase humidity. Fertilize plants as needed to help keep foliage lush. Use fertilizers in granular, liquid or stick form that are intended for indoor houseplants, and adjust feeding schedules seasonally to mimic plants' natural conditions. Groom houseplants to remove poor foliage and help plants keep their shape or training them to a suitable size. Repotting is occasionally necessary, and proper pruning will help keep foliage healthy. Cleaning foliage should also be a regular part of grooming. 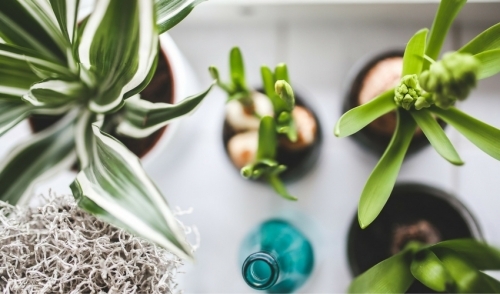 With proper care, houseplants can be a beautiful addition to any home, and providing that care is easier than many novice houseplant owners realize. Choose a good plant, care for it well, and you'll enjoy it for years to come.